What Is Split System Air Conditioner and What Makes It Different? How Easy Can an Installation Process Be? Gone are the days when having AC at home used to be a big thing. Nowadays, every second person has AC in their homes. As the demand increased, various companies started making a different type of air conditioning machines. One of the most popular air conditioning machine types is a split system air conditioner. Split air conditioners are designed with two separate units such as indoor unit and outdoor unit. You need to install the indoor unit inside your room and you can install the outdoor unit at your exterior wall. Outdoor units are designed with the condenser and it will extract the heat from your rooms and generate cool airflow. So you can easily keep your rooms cool with the split system air conditioners and it is suggested to install the same by experienced professionals. To be honest, there is no such big difference between the split system air conditioner and normal type of air conditioner. The functioning and working module of both these are almost the same. Their design and outdoor bodies are what make them look different. Since we have understood what split system air conditioner is all about? Let’s jump onto its various benefits. One of the best things about the split system air conditioner is that it cools down the entire house more efficiently as compared to the window air conditioners. With the help of ductwork, the air does not only remain in one room but spread all over the house efficiently. Apart from that, you can also control the temperature of different rooms by regulating the airflow of your split system air conditioners and you can easily do it by the remote control system. 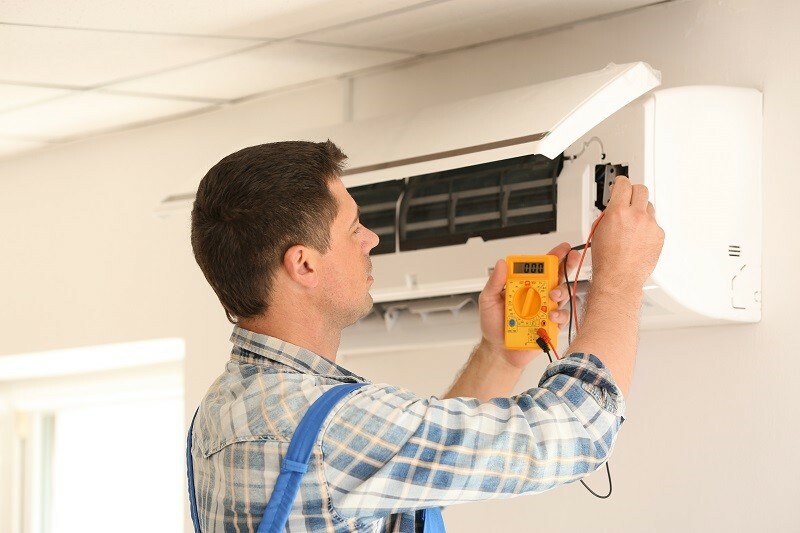 The installation procedure of a split system air conditioner is quite challenging as it requires a time-consuming process. The split system air conditioner as the name suggests has two parts i.e. outer body and the inner body. It is true that the procedure is quite a time consuming but once it is installed, you’re going to have the best time of your life in your home. Most of the manufacturers provide free installation facility and you can ask for this service from the manufacturer. Even you can also install the same by experts by spending few amounts. While planning to buy something new, one thing which comes in our mind is the cost that needs to be paid. Most of the people cannot afford those high-end quality products which cost way too much. In such cases, getting quality products at an affordable price can be done by the online shops. As far as split AC is concerned, the installation price may cost more than another type of ACs but once it is installed, you hardly have to spend any maintenance cost in the future. Since all the rooms get cold at once, you really don’t need to get your AC installed in each room. One split system air conditioner can actually make the entire house cool. This way there would be less electricity usage and you can save your electricity bill by installing such air conditioners in your home. There is no doubt that a split system air conditioner is a good investment when it comes to saving energy and money. However; the split system air conditioner is one of those air conditioners which come with both pros and cons. If you’re okay with the cons that split system air conditioner has, this type of air conditioning system can actually provide you best of both worlds.